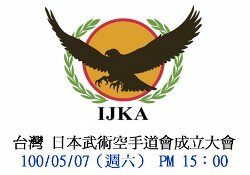 �ｼ咾onventionally karate tournaments have been hosted by China Karate Association, but this time the host is IJKA China. 繝ｻ Promotional materials such as polo shirts and T-shirts will be provided to the event窶冱 VIPs, judges and admin support staff. 繝ｻ Estimate the participants to be about 250 to 300 people. 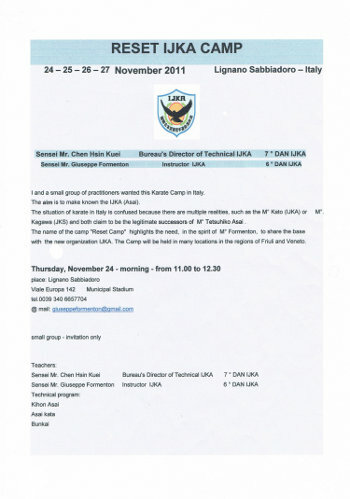 �ｼ茨ｼ費ｼ� Costs to be borne by IJKA Honbu? 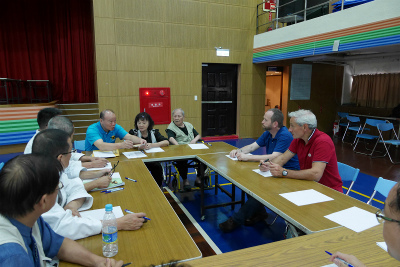 �ｼ茨ｼ暦ｼ臼ossibility of hosting a sightseeing tour around Shanghai after the tournament? 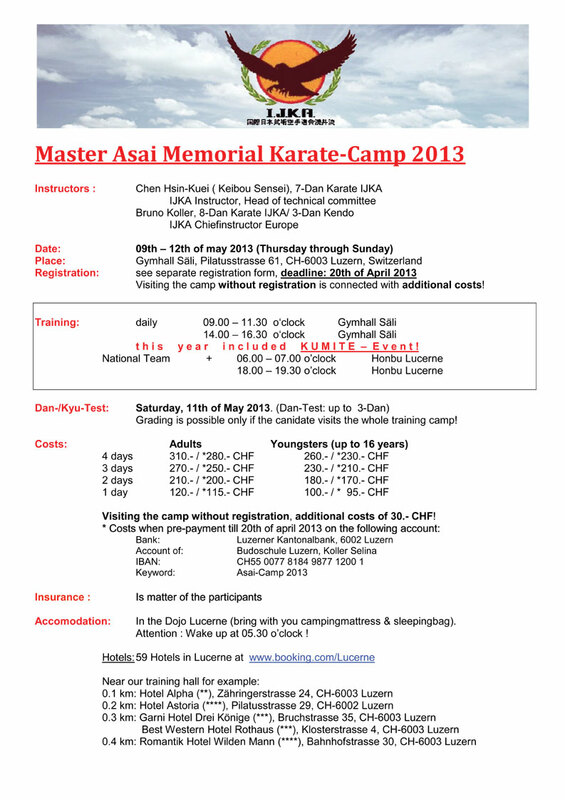 We Declare That The IJKA Certified By The Japanese Cabinet Is The Soke of Asai Karate. We declare, as a resolution of the global meeting, that Master Asai Tetsuhiko is the Soshi of the International Japan martial arts Karatedokai (IJKA) as well as of Asai Karate, and that the Not-for-Profit Organization, the International Japan martial arts Karatedokai (IJKA) certified by the Japanese cabinet, is the Soke of Asai Karate. 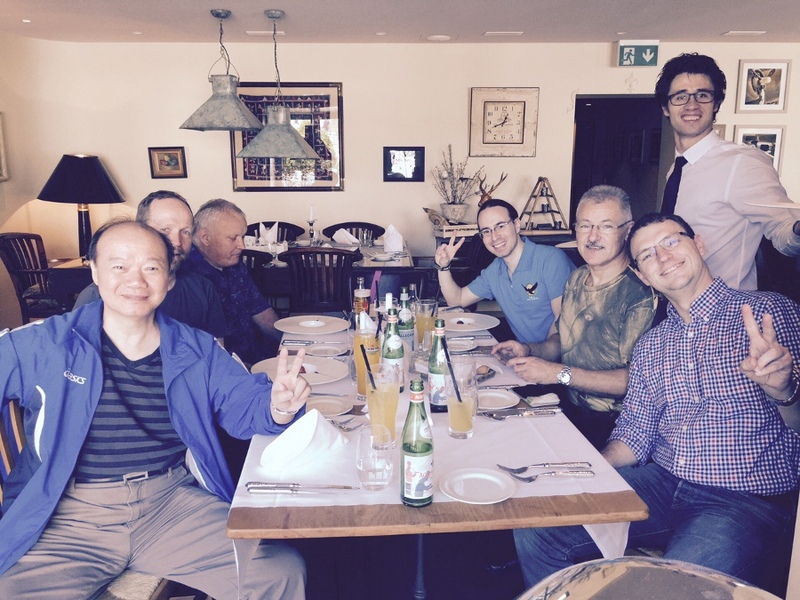 After the press conference we held the IJKA global meeting. The agenda for the meeting was about establishing IJKA as 窶彜oke.窶� The topic was sent to the participants prior to the meeting so that they were able to discuss the matter within their respective countries before coming to the table to vote. 2. 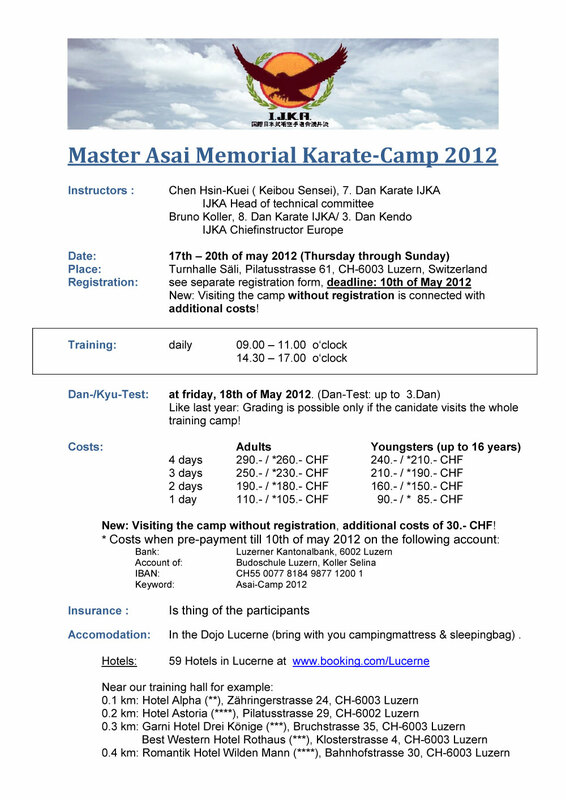 Master Asai is the Ryuso of IJKA as he created his karate waza and kata. 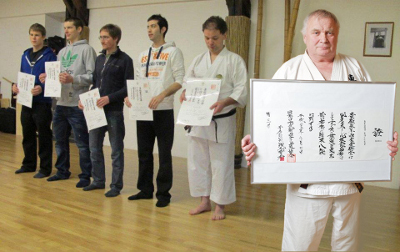 Since IJKA is not bound to one single school/ryu, he should be regarded as the original master, Soshi. 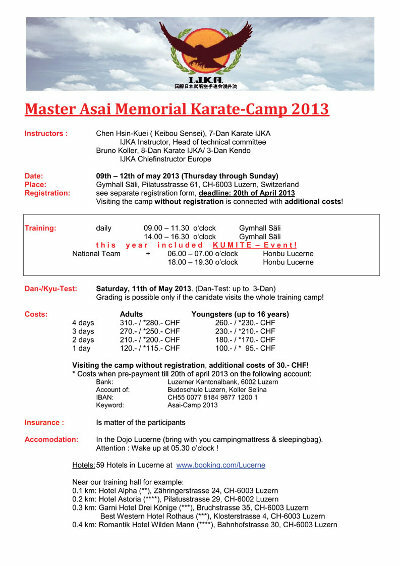 For these reasons, from now on we will officially call Master Asai the Kaiso and Karate Soshi of IJKA. 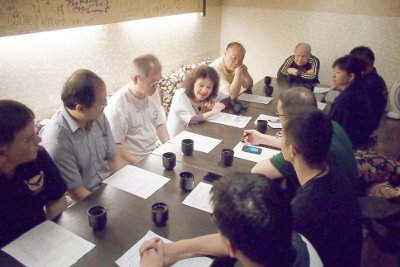 There are currently a few organizations outside of Japan that call themselves IJKA, and this is an uncomfortable situation for all parties involved. After Master Asai窶冱 passing, I was under medical treatment for a broken spine for three years and unable to do much. So I imagine those students who were left alone without the master were exasperated at that time, and had to start up their own IJKA groups. 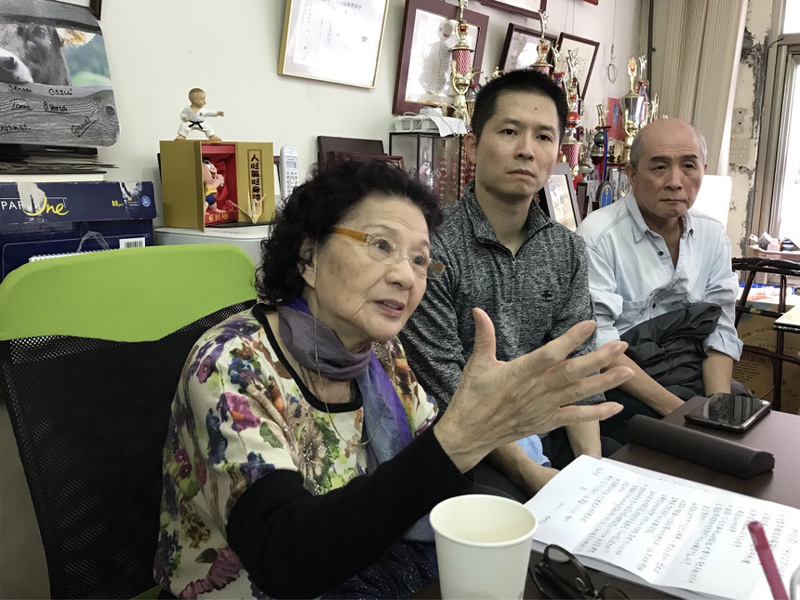 I do not feel that we need to make a fuss about them, except for those who abuse Master Asai窶冱 name. 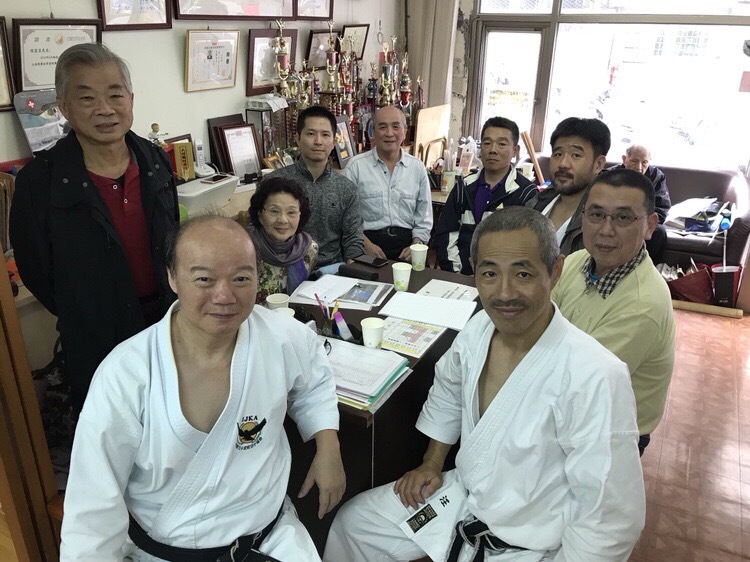 Master Asai had a very strong mentoring relationship with some of them, so I have not had any intention of being adversarial against them, but I could not find the best way to solve this situation. 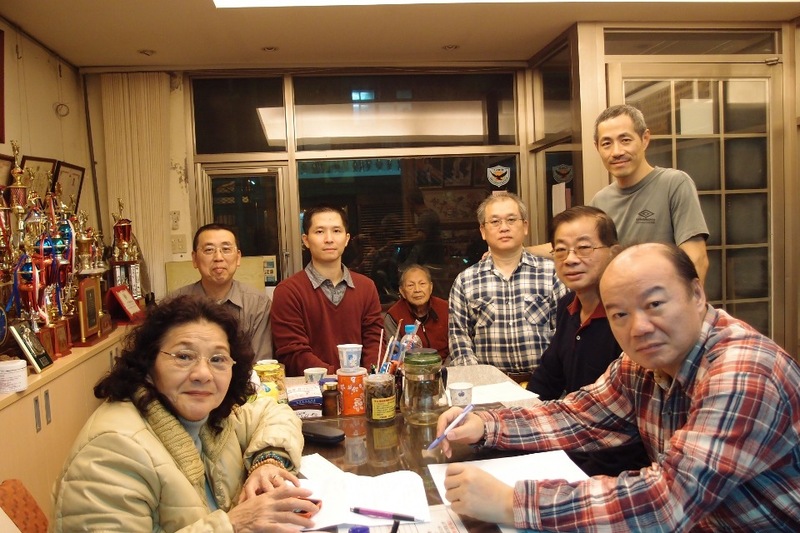 Going forward, however, I believe the best way is to use the Japanese traditional system, and regard Master Asai as our IJKA窶冱 Soke (the original family), and acknowledge other IJKA groups as our Bunke (branch family). 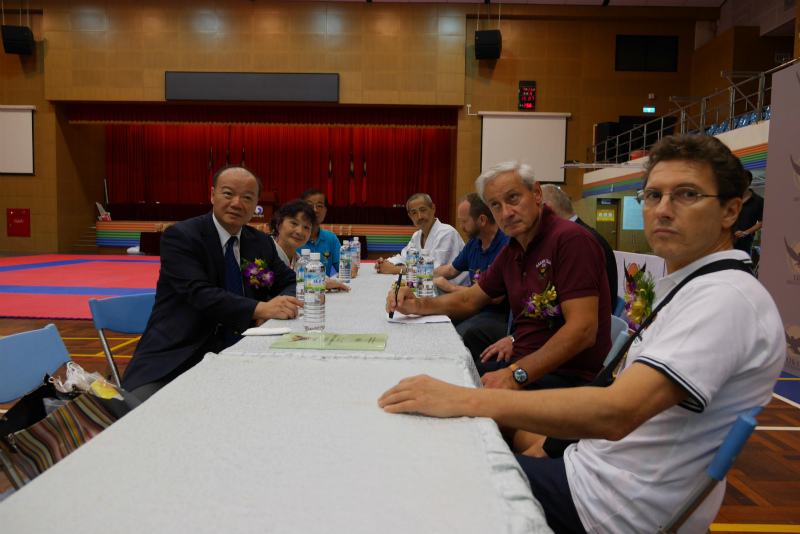 In case of a karate event, Soke will ask Bunke if they would like to join, and we can cooperate. 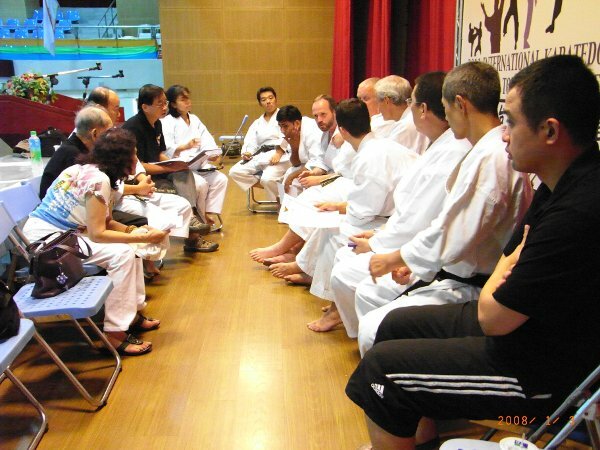 In order to act in accordance with Master Asai窶冱 belief that 窶徼hose who are learners of Budo should work together,窶� let alone following the same Asai karate under the same name of IJKA, we should develop a friendly relationship. If needed, we can exchange techniques. Furthermore, on the premise that we do not get involved with the operation of their IJKA organizations, we can issue certificates of Bunke, if there is a request. I wonder what everyone thinks about my proposition? 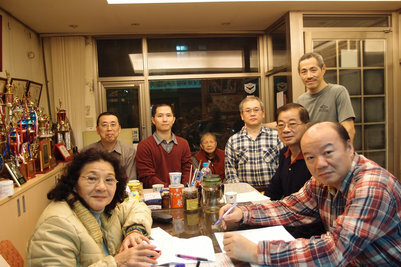 The proposal was agreed by consensus. The participants of the meeting made a pledge to forever protect and ensure a proper succession of Asai-karate under the name of Soke. 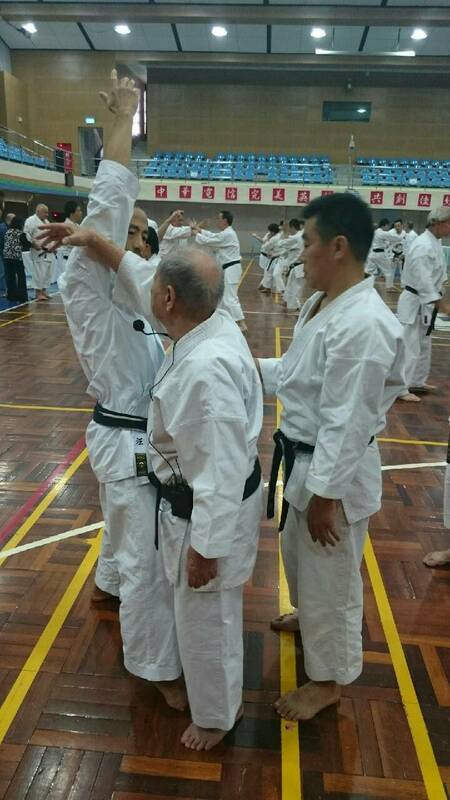 Our Shuseki Shihan Chen Hunt-tsung sensei showed the participants 窶廝ujyutu Karate窶拌t the technical seminar held in conjunction with the 2014 Asai Cup IJKA International Karatedo Friendship, The room was filled with zealous students beaming with happiness trying to master the skills. The head of technical office, Chen Hsin-koei sensei performed the Bujyutu Karate, which is not part of the conventional karate a sport. 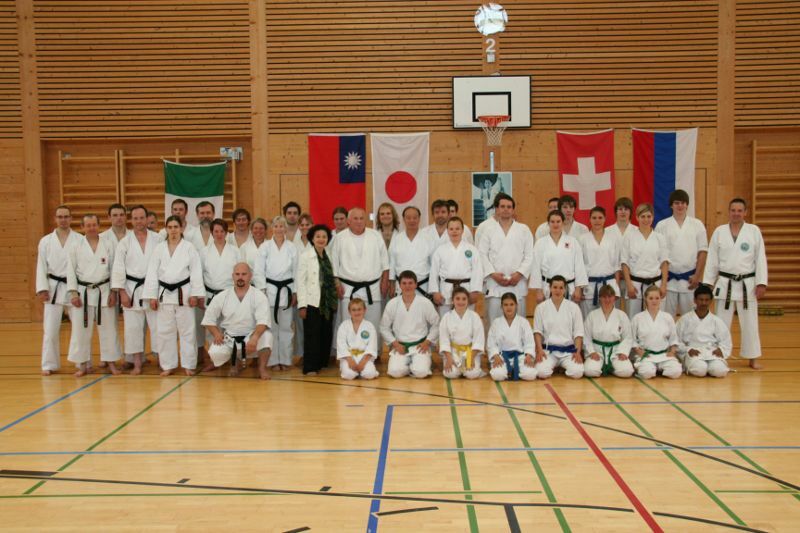 Seeing the embu, the participants were thrilled to see the remarkable power of this karate. 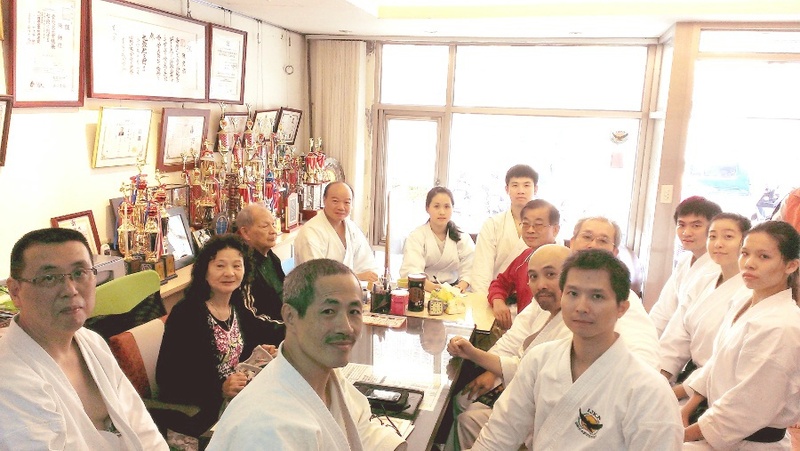 The embu was followed by Chen Hsin-koei sensei teaching the kata 窶徭eiryu (髱呈浹)窶� that Master Asai drilled into him thirty years ago, and it was also well received by the participants, who continued the fervent training. 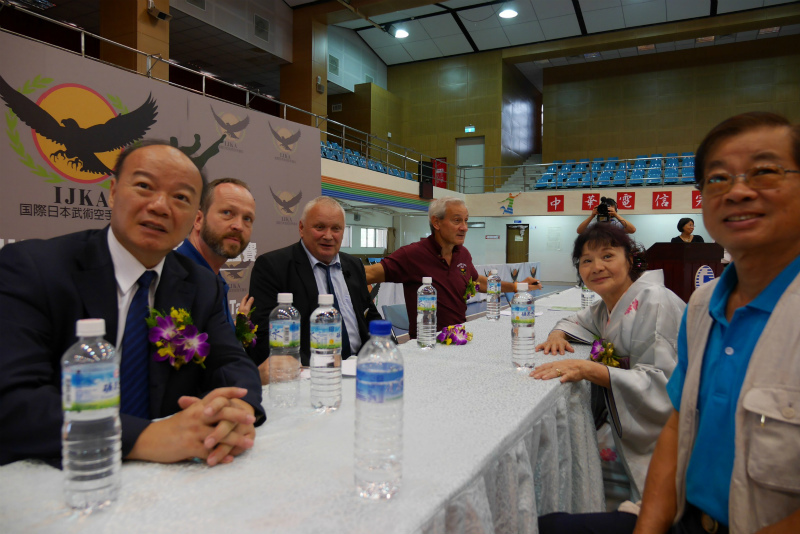 Following the great success of 2014 Asai Cup IJKA International Karatedo Friendship Tournament that was held on September 27th this year, a technical seminar was held the next day. 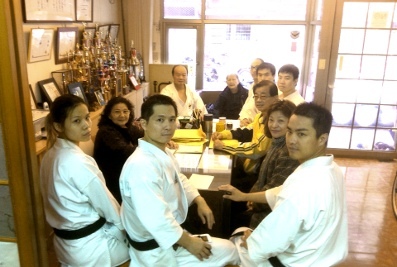 Participants were eager to learn the new kata of 窶彜eiryu,窶� and the room was filled with their excitement. Mr. Chien Chih-Ying , Mr. Lyan Hong-Tau. 窶弋opics 2014 IJKA Taipei International Karatedo Friendship Tournament Preparation Meeting. 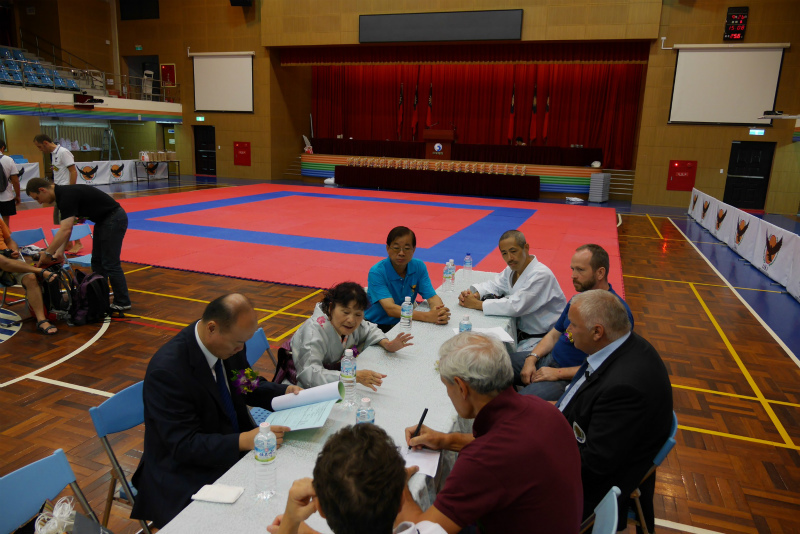 繝ｻThe sightseeing tour for the tournament participants was decided to be hosted by the President. such as attending technical seminars and trying out and obtaining instructor/dan examiner/tournament judge certificates. Without actually being involved in these activities, there is no point in having them. 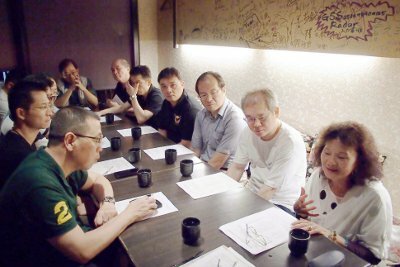 The participants at the meeting agreed that IJKA officials should meet in person any applicants to understand each other and establish a good line of communication before accepting any new members. 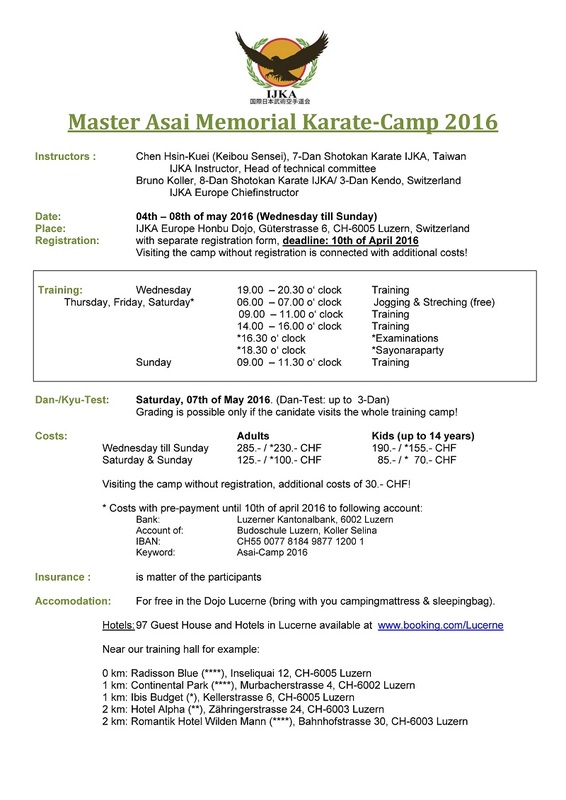 who is interested in applying for a membership to come to join the 2014 IJKA Asai Cup Taipei International Karatedo Friendship Tournament. 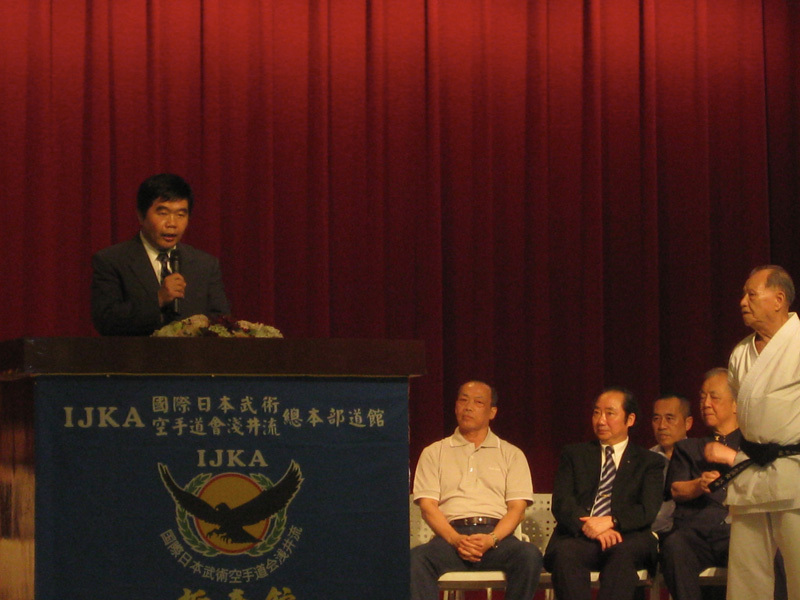 繝ｻThe president also revisited the reason why IJKA established the Honbu dojo in Taiwan. 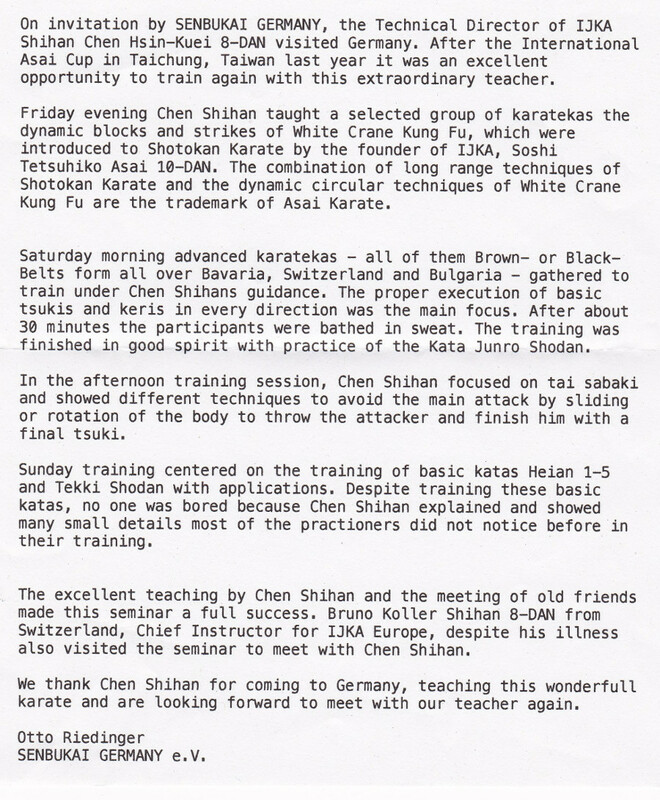 with regards to the people involved with his other karate organization that he and Keiko Asai established. 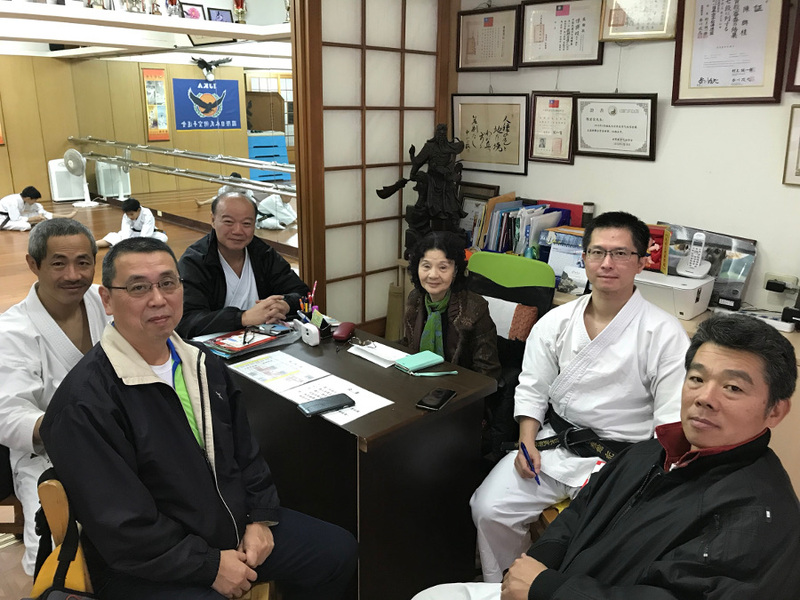 we intentionally did not establish the IJKA honbu dojo in Tokyo, or in Japan, in order to show gratitude and to accord them with every courtesy. This decision is based on Bushido. was the most appropriate person for IJKA窶冱 shuseki shihan, and the honbu dojo was established in Taipei. 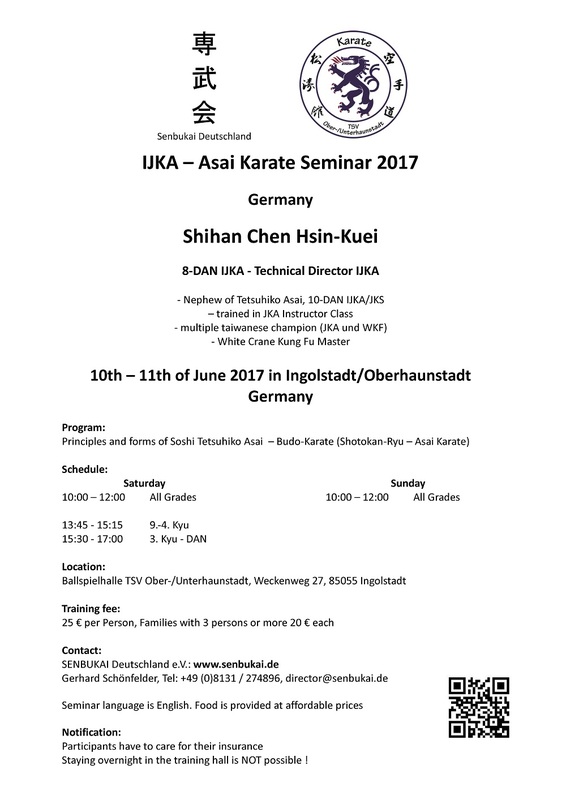 莠�隗｣謇�隰�IJKA Asai karate 闊�蜈ｶ莉北arate 荵倶ｸ榊酔闊�蜈ｶ邊ｾ蟾ｧ,螽∫憲. We had a very good and powerful Master Asai Memorial Camp 2013 in the European Honbu Dojo in Lucerne-Switzerland with good spirit and good friendship. About 30 Karateka trained in this camp from early morning 06.00 o'clock until evening 18.00 o'clock. 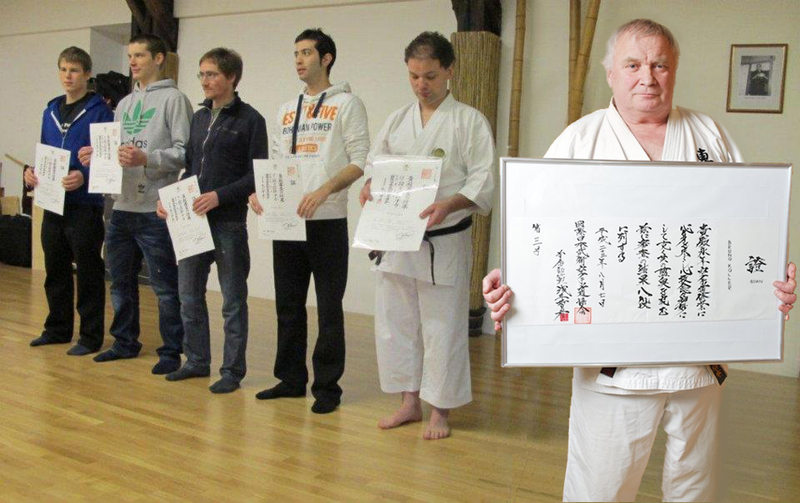 Six students passed with sucess their Shodan examination. 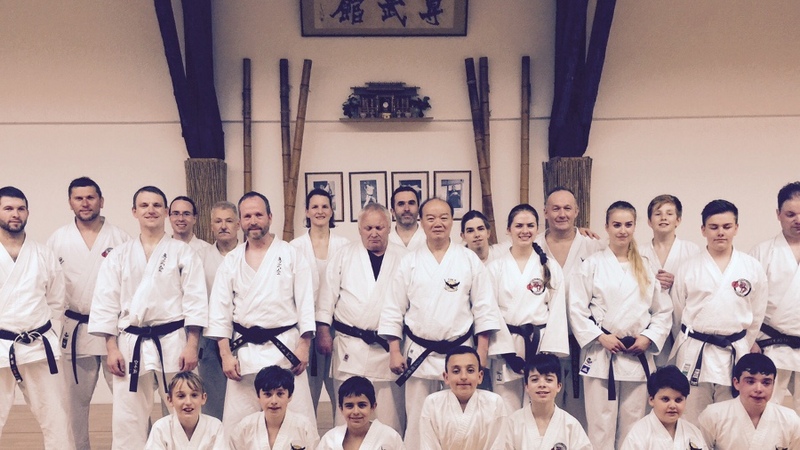 Thank you again, Keibou Sensei for your excellent teaching, and many thanks to all students visiting the Camp! 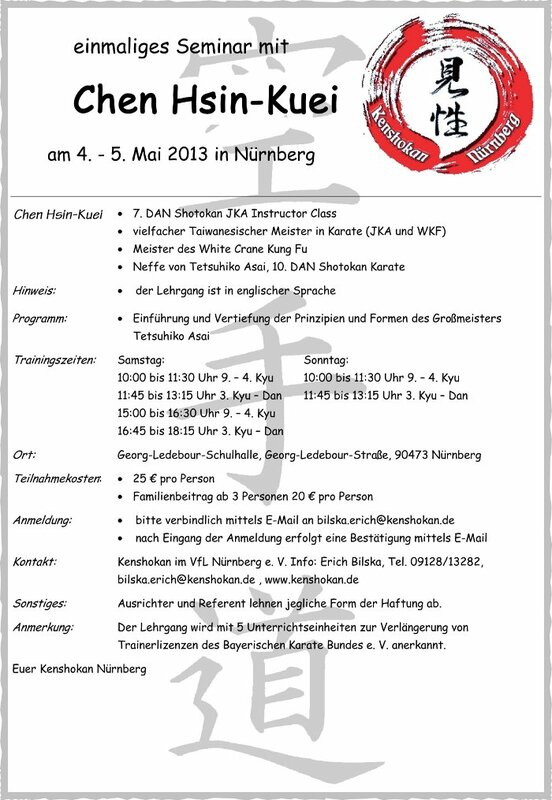 笆�縲窪inmaliges Seminar mit縲� Germany: We have received a report from the Global Section Taipei Honbu Dojo, Mr. Lin maw tsun. Now has grown to have about 20 member countries. 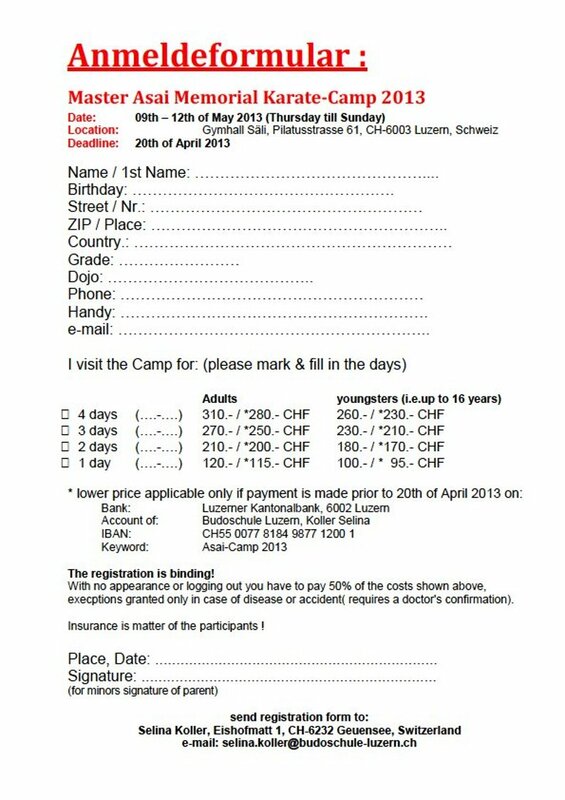 It held the first Instructor Committee Meeting at the same time with Annual Karatedo Techinical Seminar, in Gams, Switzerland from May 13th to 17th. Around 100 people came to participate in the seminar. 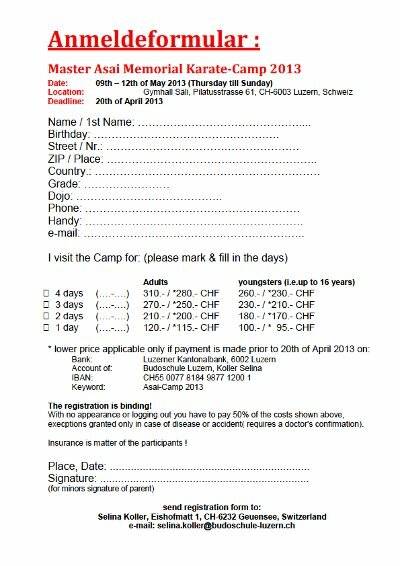 The participants came from Geneva, Germany, Russia, and also from Italy, from which people travelled over 7 hours in two cars. 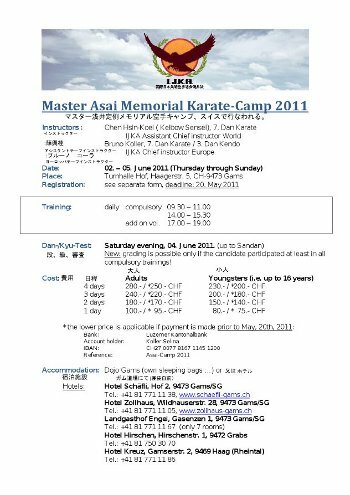 There, in memory of Master Asai and six national flags fluttering in the air, everyone practiced in an air of excitement. 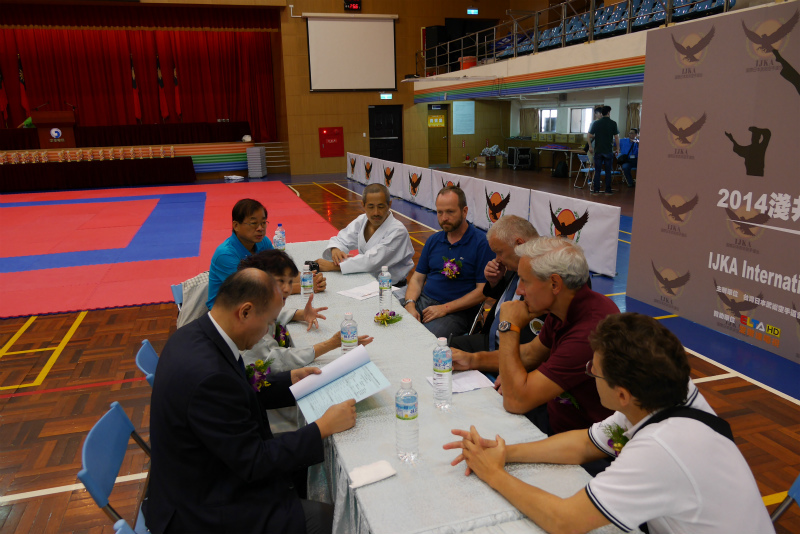 Assistant Chief Instructor, Mr. Chen, Hsin-kuei (7-dan) led the seminar. 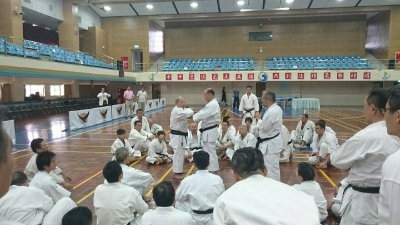 He started karate when he was 7 years old and since then, for 47 years, he has been following Master Asai窶冱 teachings and dedicating his life to karate. 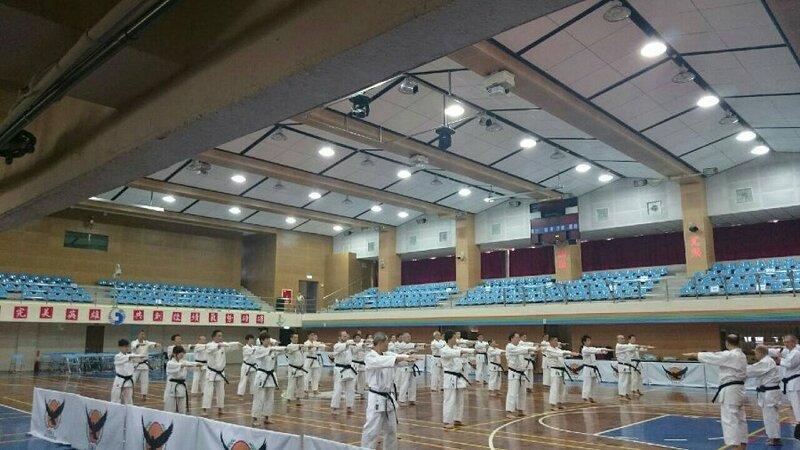 - Other advice included - Asai-ryu only uses one arm for kobo (offense and defense) where most people used both arms, switch from Kiba-dachi to Souchin-dachi (Fudo-dachi) in order to accommodate the hip twist of Joko Sansei, Junro Nidan is Morote-uchi where most people incorrectly used Morote-uke. 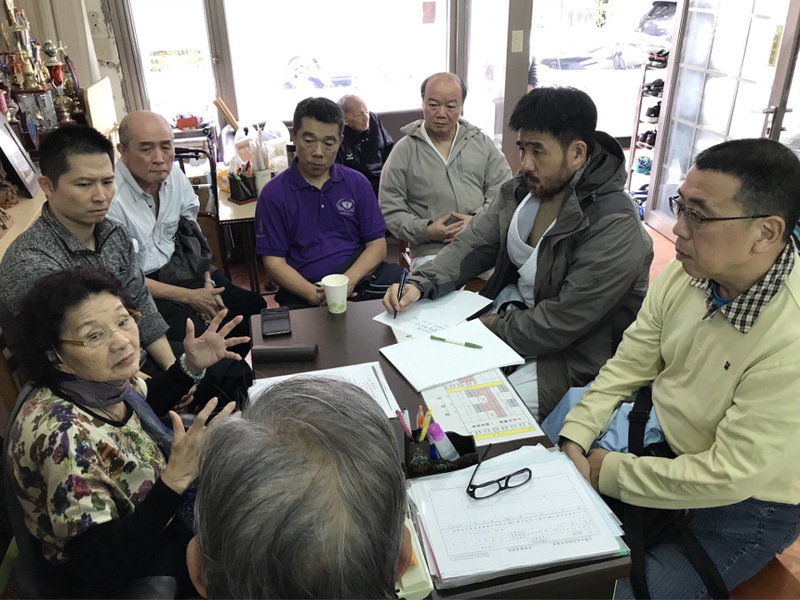 The participants who were following the general forms before found the training and the pinpoint advice fantastic, as these were just what they needed.